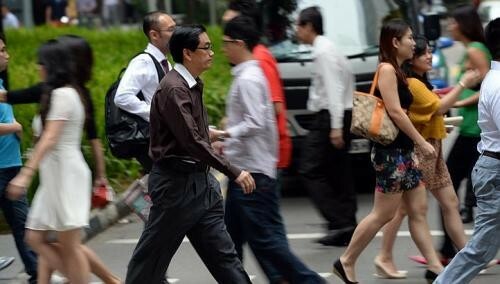 Expect a flurry of activity in the Manpower Ministry before changes to Singapore's main labour law kick in on April 1. The Manpower Ministry (MOM) will be holding talks and workshops to get firms and workers ready for changes to the Employment Act enhancing the minimum employment standards that firms must stick to. "We will reach out to employers, employees, human resource practitioners and the general public through seminars and workshops, collateral and mainstream media advertorials," said an MOM spokesman. The changes to the Employment Act were passed in Parliament in November. Among them is an increase in the monthly salary ceiling from $2,000 to $2,500, which puts 150,000 more rank-and-file workers under the protection of the labour law. Also, another 300,000 professionals, managers and executives earning up to $4,500 a month will be protected against unfair dismissal and be able to claim sick leave benefits, both of which they could not do before. To prepare firms, MOM has roped in employer groups such as the Singapore National Employers Federation, Singapore Business Federation and Association of Small and Medium Enterprises (ASME) to brief about 2,500 employers. From next month, over 3,500 human resource staff will also be put through one-day workshops run by employer groups. Firms will get help in the crafting of employment contracts which include the new provisions to give workers more protection. Other than raising public awareness on the changes, the MOM said it also wants to encourage the public to blow the whistle on errant firms which flout the law. "Everyone has a part to play, even if you are not an employer or even an employee," said the spokesman, adding that whistleblowers can call or e-mail the ministry at workright@mom.gov.sg. Besides targeting firms and workers, chairman of the GPC for Manpower MP Zainudin Nordin suggested that the ministry can also reach out to tertiary students to give "them a basic understanding of the labour laws before they start working". Checks with several small and medium-sized firms found that most have not started thinking about how the Employment Act might affect them. "What I know is that some law has changed and I will rely on newspapers to tell me about what to do closer to the implementation date," said the owner of an Ang Mo Kio provision shop in Mandarin. ASME president Kurt Wee is not surprised. He said SMEs are busy trying to make ends meet. "This is why it is good to start the process of preparing them early."